Panchmukhi Hanuman is the rare five-face form of Hanuman. He appeared in this form of annihilate Ahiravana who had taken Ram and Lakshman to the netherworld or patala. 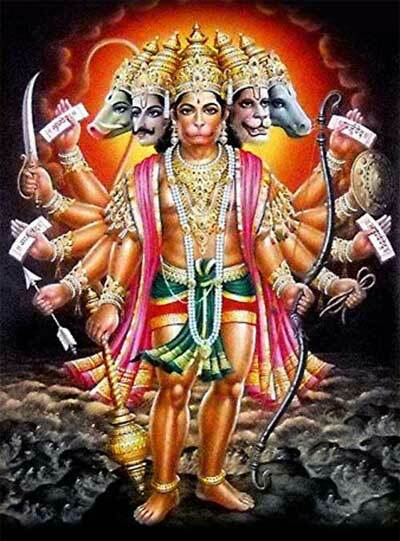 There is deep symbolism and meaning attached to the five face of Hanuman especially in tantric puja. Each face of Panchmukhi Hanuman have three eyes. This form has ten hands. 9 hands hold various weapons. One hand is in blessing posture. Varaha Murti face of Panchamukhi Hanuman is faces north. The direction of Narasimha face is south. Hayagriva looks up towards the sky. The east facing Hanuman destroy all kinds of enemies. This includes enemies like anger, ego, sadness, frustration etc. The west facing Garuda has the power to remove all kinds of difficulties in the life of a devotee. The north facing Varaha blesses a devotee with long life, good health, strength and fame. The south facing Narasimha removes fear from the life of a devotee. This includes fear of future and fear of death. He also removes all kinds of unwanted thoughts. All mental disturbances are removed by this face of Panchmukhi Hanuman. The sky facing Hayagriva fulfills the desires of the devotees. Meditate on Panchmukhi Hanuman and chant this mantra 108 times Om Hari Markad Markadaya Swaha (ॐ हरि मर्कट मर्कटाय स्वाहा).